Contest #336 answer: Ivanpah Solar Power Facility, Mojave desert, CA, USA – Where On Google Earth? 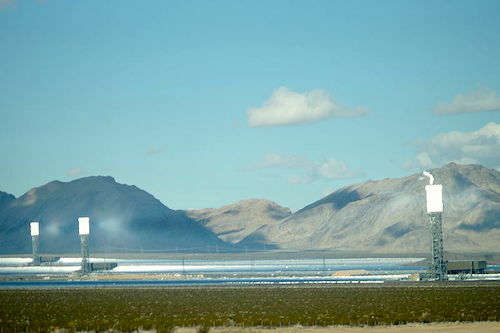 The largest solar power plant in the world was constructed in the Mojave desert in California, USA. It is the Ivanpah Solar Power Facility and it formally opened on February 13 this year. In total it consist of three concentric circles of mirrors, focussed to beam up to three towers with steam turbines. It should produce some 377 MW per annum.